Professor Rogers’ main interests are in American Politics. His research and teaching engage with questions about the intersection of race, ethnicity, immigration, place, and political behavior as well as with topics in public opinion and urban politics. His first book Afro-Caribbean Immigrants and the Politics of Incorporation explores how Caribbean-born blacks are changing and complicating black politics in New York City and the United States. The study closely analyzes how racial discrimination, bias, and stereotyping shape the group’s political integration patterns. The book won best book awards from APSA’s race, ethnicity, and politics section and urban politics section in 2007. Rogers has held fellowships with the Social Science Research Council, the Ford Foundation, and the Radcliffe Institute at Harvard University. He is currently at work on a new book on the politics of black suburbanization. 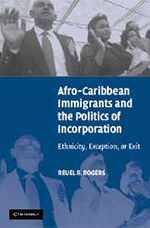 Afro-Caribbean Immigrants and the Politics of Incorporation: Ethnicity, Exception, or Exit. Cambridge University Press; 1 edition (June 29, 2006).